(Bloomberg) -- Clashes near Tripoli continued for a third day as Libyan strongman Khalifa Haftar’s troops pushed toward the capital, ignoring a plea by the United Nations to end the fighting that could draw the North African country into civil war. Speaking in Benghazi on Friday after meeting Haftar, United Nations chief Antonio Guterres told reporters he was leaving the country with a “heavy heart” but still hoped “it will be possible to avoid a bloody confrontation in and around Tripoli.” He had earlier met with Fayez al-Sarraj, the leader of the internationally recognized government in Tripoli. As Guterres spoke, Haftar’s troops clashed with opponents in Souk el-Khamais, roughly 50 kilometers (31 miles) south of Tripoli, local media reported, an offensive that coincided with his arrival. 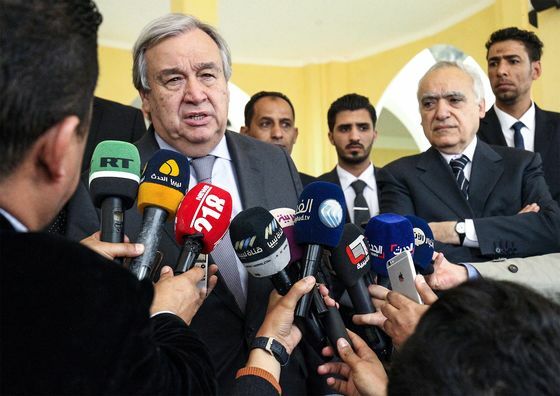 The UN chief was in Libya to prepare for an April 14 political conference, and the timing of the attack dumbfounded even Haftar’s foreign supporters, diplomats said. A Libyan National Army Facebook page later said its troops moved into the town of Qasr Ben Ghushair, near a disused airport on the outskirts of Tripoli. LNA spokesman Ahmed al-Mismari said his forces captured the airport, but Tripoli’s Interior Minister Fathi Bashagha denied that on a local television station. "We will not stop," Mismari said in a press conference. "Tomorrow the battle will be on the edges of Tripoli." The offensive came after weeks of negotiations for a new unity government, and after a meeting in Abu Dhabi, where the U.S. warned Haftar against marching on the capital, diplomats said. Haftar, the French- and Emirati-backed field marshal who had taken the east before sweeping through the south in January to control the OPEC state’s largest oil field, had always said he would seize Tripoli. Diplomats say they had expected him to launch a show of force ahead of the talks, but not attempt to move on the region filled with battle-hardened militias that oppose him. The offensive has been condemned by the U.S., France and Britain, which called for the UN Security Council to convene on Friday. But it wasn’t clear whether growing international pressure would work on the famously hard-headed commander, who has shown no sign of backing down. Haftar’s forces had said they would be welcomed in Tripoli, but the offensive has stirred up a hornet’s nest. “Actors at opposite end of the spectrum in Libya view this conflict an existential battle, and I think Haftar underestimated this,” Libyan analyst Emad Badi said. Sarraj has mobilized forces and ordered air strikes when needed. Powerful and battle-hardened militias in the northwestern city of Misrata have sent reinforcements to Tripoli, while an anti-Haftar militia in Zawiya attacked LNA troops and took dozens prisoner, according to Libyan media that aired video footage of the captured soldiers. “Factor in Haftar’s relentless obsession with military maneuvers, Western actors’ backlash and an international community incapable to intervene, the picture is very negative,” Badi said.